Wai reviews the final edition of Being the Elite (Ep. 117) prior to “All In” this weekend with promos from Marty Scurll & Cody, an appearance by Theo Rossi, Christopher Daniels confronts Stephen Amell, and Black Machismo resurfaces. A discussion on the NWA’s Ten Pounds of Gold series to promote the NWA title match between Nick Aldis and Cody for this Saturday at “All In” with a look at Aldis’ performances, the difference in style from Being the Elite and the build-up of this one match on the series. 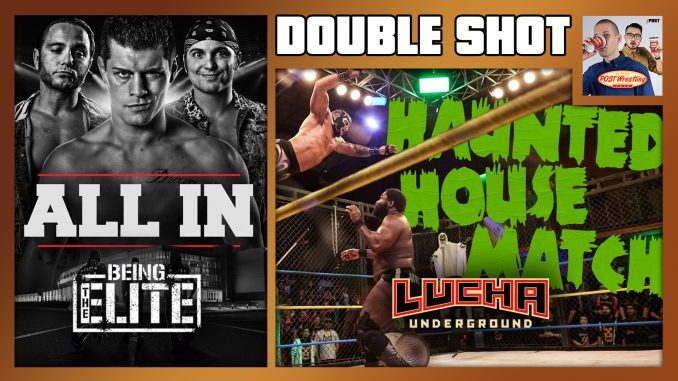 Finally, John reviews the Aug. 23rd episode of Lucha Underground that featured a Haunted House match between Mil Muertes and The Mack, the hospitalization of Melissa Santos, the wedding date for Johnny Mundo & Taya, the Last Man or Machine Standing match between Pentagon Jr. and Cage, and another murder!